This page is for existing arm9loaderhax users to update their devices to boot9strap. All future releases of Luma3DS will only be made in the .firm format, which will only be compatible with boot9strap and sighax. This means that to continue receiving the latest updates of Luma3DS, you should use this page to update your installation. If you have a PIN enabled on Luma3DS, SafeB9SInstaller will give you an “OTP Crypto Fail” error unless you temporarily disable your PIN (you can re-enable the PIN after the update). Note that the following required file named secret_sector.bin is the same one that was found in the various data_input.zip file versions. If you already have that file on your disk somewhere, you can use that one instead of downloading the one below. Note that, only on New 3DS, secret_sector.bin is needed to revert the arm9loaderhax exploit, which is why it is not needed for the installation of boot9strap on a stock console. If you do not have a New 3DS, you do not need secret_sector.bin. Once it has completed, press (A) to reboot your device. If, before following this guide, you already had an EmuNAND setup and would like to move the contents of your previous EmuNAND to your new SysNAND CFW, now is the time to follow Move EmuNAND before doing this section. You can now use Luma3DS Updater to update your Luma3DS to the latest version just by opening it and pressing (A). This is not the same thing as a System Update; it just downloads and extracts the newest Luma3DS files. This will only update the Luma3DS files on your SD card. If you boot your device without an SD card, it will use the version you placed in CTRNAND. You will now boot Luma3DS CFW SysNAND by default. You can now hold (Select) on boot to launch the Luma3DS configuration menu. 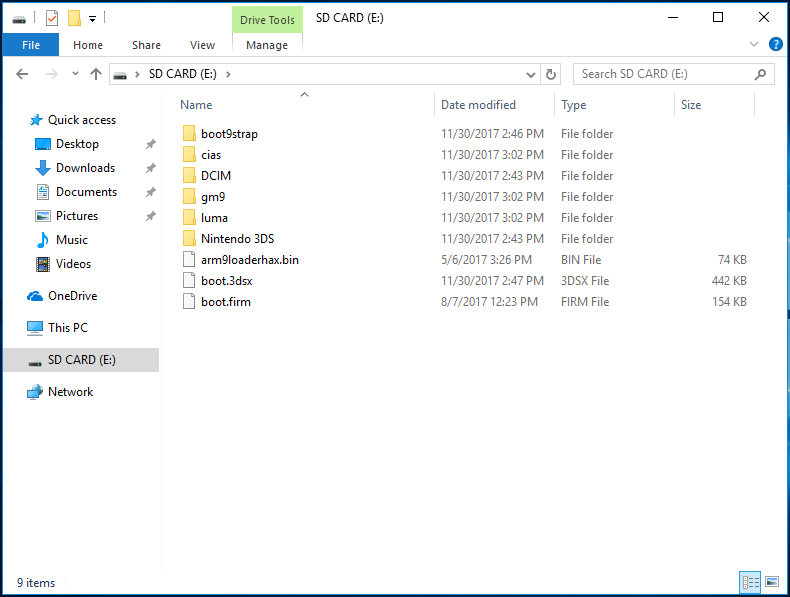 You can now hold (Start) on boot to launch the Luma3DS chainloader menu (note that the Luma3DS chainloader menu is only displayed if there is more than one payload detected). You can now hold (Start) + (Select) + (X) on boot to dump the ARM11 bootrom (boot11.bin), the ARM9 bootrom (boot9.bin), and your console unique OTP (OTP.bin) to the /boot9strap/ folder on your SD card (note that this will not have any kind of prompt or message). To use NTR CFW, install BootNTR Selector. For information on changing your device to another region, check out the Region Changing page. For information on using GodMode9’s various features, check out the GodMode9 Usage page. For information on using Luma3DS’s various features, check out its wiki. For information on installing custom themes and splash screens, check out Theme Plaza.